And in story comments and in periodic emails I’ve been hearing terms like mass protest, naked protests and about any other form of protest there is. All I can say is it has been a while since I have covered mass acts of a mob of angry citizens but I’m game if you guys are as the reasons for Jim Hood turning a blind eye to improprieties in the Coastal Impact Assistance Program come into much sharper focus. But before we get to that I think we can now conclude that Jamie Miller released the preliminary report months after the fact in order to soften the blow in the final report, which he certainly knew was close to completion when he leaked the first report out to the Sun Herald. Mississippi Attorney General Jim Hood wants to hear from whistle-blowers with inside information about how the Gulf Coast Claims Facility is operating. Hood believes GCCF administrator Ken Feinberg “stiff-armed” claimants on emergency and interim claims because they required no release of the right to sue BP and other parties responsible for the April 2010 Gulf oil catastrophe. When claimants grew desperate, Hood believes, GCCF rolled out final payments that do require waiving the right to sue. As SLABBED has repeatedly mentioned, Hood learned all he needed to know about “waiving the right to sue” from the MID mediation program that “stiff armed” State Farm policyholder claimants in the aftermath of Hurricane Katrina. IMO, that lesson accounts for his current insistence that there is no relationship between the number and amount of paid claims and the integrity of the claims process! Anyone heard a whistle blow? Pete and Repeat sat on a fence – Hood repeats warning, Young repeats attempt at revirgination, Peytavin pumps another Peytavin – but too much snow to see the fence! In the filing, Hood contends that Feinberg’s process, by freezing interim payments, increases the financial hardship on claimants and makes them more likely to sign away their legal rights. 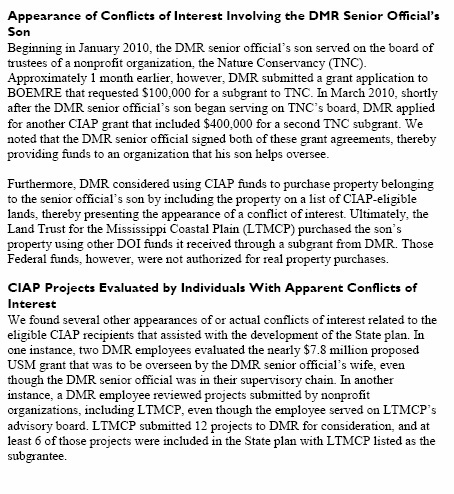 Details of Hoods allegations are summarized in the Press Register story (h/t to reporter Dan Murtaugh) and detailed in Hood’s Memorandum of Authorities in Support of Statement of Interest on Behalf of the State of Mississippi (below in scribd format). Judge Barbier shouldn’t need reminding a similar financial hardship resulted in claimants signing away their rights following Hurricane Katrina only to discover more damage later. Nonetheless, I’ll repeat myself and say that Attorney General Hood is now Twice Right and Judge Barbier should heed the warning. Author Posted on February 2, 2011 Categories NowdoucitTags Attorney Michael D. Peytavin, BP Gulf Oil Spill Litigation, Corruption in Jefferson Parish, Federal district judge Carl Barbier, JP Parish President John Young, Judge John L. Peytavin, Mississippi Attorney General Jim Hood, Post-Katrina flooding of Jefferson Parish, Transparency, Whisterblower Hotline22 Comments on Pete and Repeat sat on a fence – Hood repeats warning, Young repeats attempt at revirgination, Peytavin pumps another Peytavin – but too much snow to see the fence! Others see Harrell and his brainchild in a different light – mediation fraud.